An e-mail has been sent and she has 48 hours to respond before a new winner has been selected. Family fun nights are fun times in our house. We capitalize off the ability to have our kids loving the concept of either purchasing the latest new movie or watching one that we haven't seen or playing games. With our family fun nights, we also plan a dinner that we can all help to make. This is where Old El Paso is a fun way to start the evening off right. My kids are picky eaters but they love tacos and the one brand we always buy is Old El Paso not to mention our local Publix always has it on their Buy One/Get One offers. When I was presented the opportunity through my participation with MyBlogSpark, I couldn't resist knowing how they love their dinner kits. This is one of the things that I like about the Old El Paso line of products as they carry everything we need to make a fiesta night of eating. The refried beans, salsa, seasonings and the variety of meal kits always assures a night of good food. 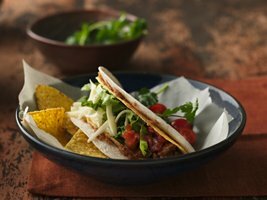 Having a Family Taco Night not only brings your family together but it also teaches them valuable skills for later in life like cooking and team work. Double Layer Tacos - It was the best of both worlds with hard and soft shells and it only takes 40 minutes to fix. Old El Paso even provides a downloadable game information to play El Tacodor to add some extra fun at the dinner table. Don't forget those box tops for school either as Old El Paso is a supporter of that which is another bonus to purchase in our family! For more great tips, recipes and more, visit Old El Paso here. Don't forget to Like Old El Paso on Facebook for news and more! One reader will win the Old El Paso “Family Taco Night” prize pack which includes a packet of original Old El Paso Taco Seasoning, a Cactus Chip & Dip Serving dish, a set of 3 Fiesta Chili Pepper serving dishes and a $10 gift card to purchase your taco fixings. Follow my blog and let me know if you celebrate a particular family fun night with your family. BONUS: Click here to visit MyBlogSpark for a downloadable coupon for $0.60 off any two Old El Paso products. I follow your blog on GFC user id Aline. We don't have a family fun night, but maybe we should start. I follow your blog on GFC. We have a family game night. I follow you on GFC(5webs). Friday night is our family fun night, but it is different every week, Sometimes Chinese food, sometimes Mexican food, sometimes pizza, etc. It depends on what we are in the mood for. I'm a gfc follower and we usually have a game night every week. Blog follower. We have taco like like once or twice a month with game and movie. Great giveaway! I'm a new follower! I make a meal with my fiance on Sunday evenings. It'd be nice to have a date night taco dinner night! i follow you gfc and our family fun night is wed- we do board games after dinner. I'm a follower. Every Sunday my family and I get together for a new recipe of soup and sandwiches that we experiment with and play board games and cards. Friday is Taco Night. That and cold Mexican beer for the adults, and Herb Alpert's Tijuana Brass on the stereo for all. Ole! I follow your blog. We have a family game night. We have a family game night and a family movie night each month. We have Family Movie Night. I already follow on GFC. We don't have a specific family fun night. I'm following on Twitter (kristisdeals1). We don't have any designated nights for a family night. However, we usually watch a movie together every night before bedtime. I entered the General Mills Gluten-Free giveaway. I entered the Starbucks gc giveaway. We have Taco- movie or game night. Monday is family fun night. I entered your Build a Bear Workshop giveaway. We just had taco night last night...one of my kids favorite meals! Usually, Friday night is family game night at our house. After dinner, we take turns picking a board game and we pop popcorn and usually let the kids have a sweet treat. On Friday nights, I pull out the sleeper sofa and we all watch a movie and sleep in the living room together on the extra comfy memory foam mattress! I follow your blog. We have family night on Saturdays. I entered your Holiday Gift Giveaway Hop. I am a follower. We don't celebrate a family fun night because we're always so busy but we will definitely start soon.